A simple and very practical working definition of a hierarchical structure is that of a structural motif contained within a larger structure or framework. Conceptually, the hierarchichal structures will consist of porous structures, either repeating (crystallographically ordered), or non-repeating (disordered), whose cavities will be occupied by crystalline or non-crystalline fillers. Examples of porous structures include porous crystalline salt inclusion materials (SIMs), metal-organic frameworks (MOFs), porous silica (including Prussian-blue and silver salt functionalized versions), and crystalline ceramic Hollandite phases. Examples of filler include crystalline salt phases, simple molecular species, silver salt nanoparticles, Prussian-blue nanoparticles, and ionic species, all either freely located inside the pores or tethered/bonded to the pore walls. The synthesis of such hierarchical structures will be achieved by exploiting previously underutilized or unrealized chemistries. 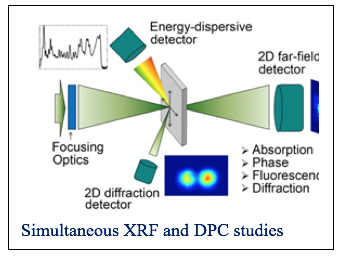 The resultant structures will be characterized using a wide variety of techniques both existing and novel, including in-situ diffraction at synchrotron and neutron facilities. Sample characterization will take advantage of in-laboratory diffraction equipment at Alfred University, state of the art calorimetry measurement systems at Clemson University, thermal analyzers at the University of South Carolina, and beam line facilities, including the National Synchrotron Light Source II (NSLS II) at Brookhaven National Laboratory for X-ray tomography and in-situ small angle X-ray scattering (SAXS) measurements. In addition, access to Savannah River National Laboratory's 773-A category 2 nuclear facility, will enable us to create radioactive versions of hierarchical structures, in addition to the surrogate versions, so as to better understand the unique properties of forms containing elements such as technetium. will be modeled using multi-scale techniques to provide guidance with regard to their preparation and behavior. Atomistic modeling of alloy nanoparticles utilizing derived Charge Optimized Many Body (COMB) potentials, and simulating atomic-scale processes will cover the lowest scales. 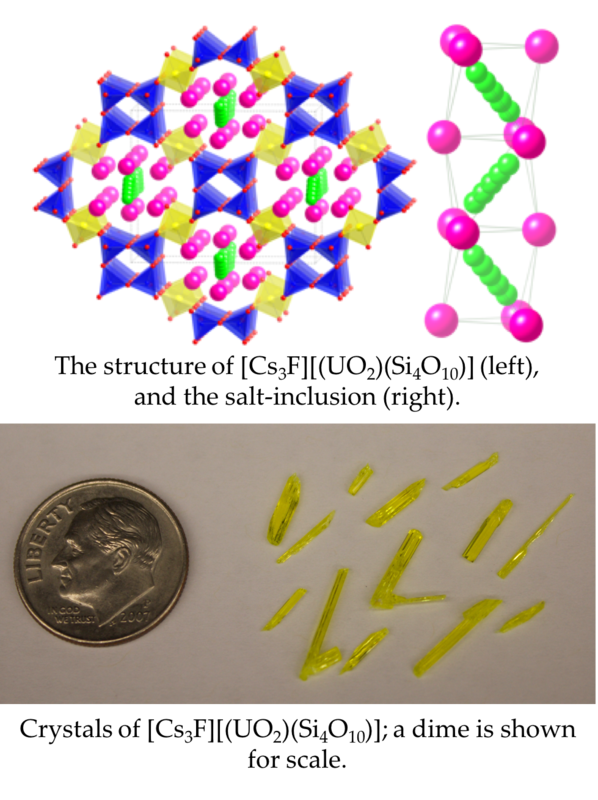 Thermochemical models, in part informed by the atomistic models, will be developed for complex phases/structures such as the salt inclusion phases that allow prediction of stability, vapor pressure, melting point, and melt viscosity, through extending approaches such as constrained equilibrium and additivity of sub-components. 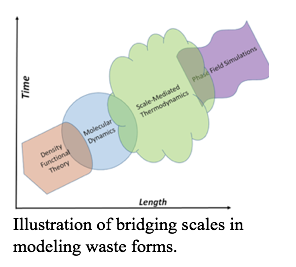 At the mesoscale, phase field methods will be generated for simulations of porous solids using atomistic datasets of surface energies, thermodynamic models, and configurational thermodynamics. The overarching results will involve the integration of simulation and data-enabled discovery that can lead to revolutionary forms of matter with tailored properties. The modeling and simulation can thus support synthesis efforts in development of the novel materials.